The following conversation between His Divine Grace A.C. Bhaktivedanta Swami Prabhupada and David Lawrence, a British schoolteacher, took place in August 1973 during an early morning walk in London. David Lawrence: In the Srimad-Bhagavatam there seems to be a great deal of … demonology, if you like. Now, I confess this raises problems for me. Are the references to, say, the demoness Putana taking Krishna on her lap and Krishna sucking her breast and killing her—is this to be taken literally or allegorically? Mr. Lawrence: Literally, as a physical fact? Srila Prabhupada: Yes. Of course, in the Bhagavatam there are some figurative stories, similar to Aesop’s Fables. These are for instruction. Mr. Lawrence: What about the reference to Krishna and the unmarried gopis [cowherd girls]? You say in your books that “He treated them like dolls, yet they were well pleased with Him.” What is the main point of that passage? Srila Prabhupada: When the Bhagavatam says Krishna treated the gopis like dolls, that means the gopis danced just according to His desire. Mr. Lawrence: Is that to be taken literally, or is there some symbolic meaning? Srila Prabhupada: No, literally. The gopis are so devoted to Krishna that whatever Krishna desires, they do. Mr. Lawrence: I must confess, these activities of Krishna’s are quite beyond my comprehension. 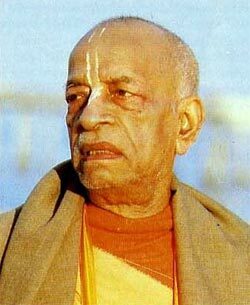 Srila Prabhupada: Yes, they are very difficult for ordinary people to understand. That is why this portion of Krishna’s life is depicted in the Tenth Canto of Srimad-Bhagavatam. Nine cantos are devoted to understanding Krishna’s supreme position. Then Krishna’s intimate lila [pastimes] are described in the Tenth Canto. But if one tries to read the life and pastimes of Krishna without understanding that He is the Supreme Personality of Godhead, one will be misled. Therefore the Bhagavatam begins by explaining the Supreme Lord as the original source of the creation (janmady asya yatah). 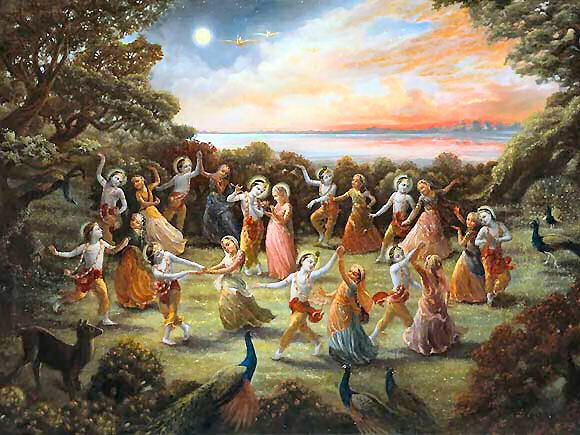 The Bhagavatam doesn’t abruptly introduce Krishna’s pastimes with the gopis . In the spiritual world Krishna has unlimited varieties of activities. The activities in this material world are only a perverted reflection of those in the spiritual world. Here lust is going on in the name of love. And because it is not love, it doesn’t continue very long—it breaks. But in the history of the spiritual world, you don’t find that the love between the gopis and Krishna broke at any time. That is the difference between lust and love. Mr. Lawrence: In the West, one in three marriages is destined to break up. That’s what they say now—one in three. Srila Prabhupada: Just see! And they are trying to drag their lusty ideas into Krishna’s pastimes. Generally, rascals claim that Krishna’s pastimes with the gopis support their own lusty activities: “Krishna acts lustily, so I can also.” This is a gross misunderstanding. People who think like this do not take into account that here in the material world so-called love is lust—and it breaks. But in the love between Krishna and the gopis, there is no breaking—only increase. So how can they compare their lusty affairs to Krishna’s loving affairs with the gopis? Mr. Lawrence: I must admit that I’ve read far enough in your books to see that they really can’t. Srila Prabhupada: When you give an analogy, there must be many points of similarity. So where are the points of similarity between Krishna’s pastimes and the lusty affairs of this material world? These rascals are so dull-headed that they don’t even have a logical argument. They are comparing the lusty affairs of this material world to the affairs of Krishna and the gopis. But where is the similarity? Mr. Lawrence: There’s never any mention at all of lust or animal desire, is there? Srila Prabhupada: No. For example the Bhagavatam describes everything about Krishna’s dancing with the gopis—their kissing, their embracing, and so on. But there is no mention of contraceptives. And the gopis never became pregnant. So how can we compare Krishna’s loving affairs with the gopis to the lusty affairs of this material world? Mr. Lawrence: It can’t be done. Another question: I was reading a book (one not put out by the Krishna consciousness movement) about Lord Chaitanya, and it said that the manifestations of Krishna consciousness He showed during kirtana [chanting] and so on were manifestations of madness. Can you comment on that? Mr. Lawrence: He’ll see a reflection of himself. Srila Prabhupada: Yes. This misunderstanding is condemned in Bhagavad-gita, where Krishna says avajananti mam mudha: “Because when I come to this world I come in a human form, rascals take Me for an ordinary human being.” (The word mudha means “rascals” or “asses.”) So, Lord Chaitanya is Krishna Himself, but the fools and rascals take him for an ordinary human being. Mr. Lawrence: They’re just talking from within their own experience. They can’t imagine what happens when God presents Himself as a man. Srila Prabhupada: When they hear that Krishna lifted Govardhan Hill, they think, “This is mythology.” But if Krishna is actually God, is it very difficult for Him to lift a mountain? He’s floating so many heavy planets in the sky. So if Krishna can make so many planets weightless, is it very difficult for Him to make Govardhan Hill weightless? These things are very easy for devotees to understand, but nondevotees cannot understand them. Therefore in the Bhagavad-gita Krishna clearly says, bhaktya mam abhijanati: “Only through devotional service can one understand Me.” So if you want to understand Krishna and Krishna’s pastimes in truth, you must take to the process of devotional service.